There are many business people, inventor, sports persons etc. have succeeded amazing success today. 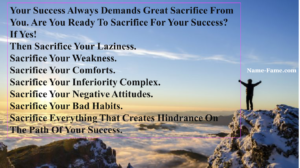 But there is no success without any sacrifice. Indeed, there are no shortcuts, the fact that every type of victory requests something from you.